In a well-wishing New Year note, Charles Fridman, president of Shalimar Management, announced that their planned ten-story residential project at 543 Second Avenue will break ground this year, and he’s now unveiled a revised set of renderings depicting a substantially different design. Evolving from banal to brutal, the previously thin-skinned, glass-and-metal design has been beefed up into an energetic, cast-in-place concrete structure of undulating floor slabs and tilting exterior columns. 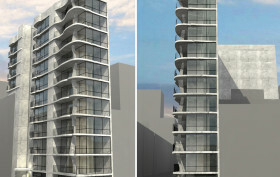 Fridman’s page states: “We’re planning a 10 Story rental building with 1-2 bedroom apartments. Each apartment will have its own balcony, and part of the building will cantilever over our other property at 249 East 30th Street.” Outdated building applications from early 2014 detail a 12-story building housing 18 units spread across 19,000 square feet of floor area. New permits have yet to be filed and according to Fridman, the team came close to building the previous design, but “thankfully” held off.